A major cause of wrinkles, or frown lines, in the brow area is facial expression habits. We can be unaware of the daily facial expressions we make, which can contribute to wrinkling in the brow area. These habits are squinting to read or avoid bright sunlight, or frowning. The skin in the brow area is thin and when we repeatedly frown or squint, lines and creases start to appear and become permanent. UV damage can also be a factor and some damage is irreversible. The T-Zone can contain an abundance of sebum, yet it decreases as we age, so this area becomes drier. Harsh facial cleansers and scrubs can be contributing factors because they tend to remove too much sebum and leave skin feeling rough and dry. The source of deep wrinkle lines is actually the accumulation of fine tiny wrinkles. 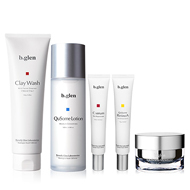 To combat wrinkles in the skin, you must first strengthen the protective functions of skin. The first step in boosting the protective function in the skin, maintain moisture in the horny (uppermost skin) layer, which keeps the skin soft and smooth. Now with a fortified protective function within the skin, we can then meticulously repair and grow healthy skin from the inside out. The next step is to maintain the skin’s firmness and elasticity with Vitamin C and Retinol (Vitamin A1), two of the most exemplary ingredients for preserving the skin’s firmness and elasticity. For finishing touches, these ingredients also build the foundation of skin and keep it plump and full. In order to prevent the decline of the hypodermis’(inner tissue and fibers) functions, it’s essential to reduce exposure to UV to effectively combat deep wrinkles in the skin. 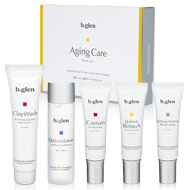 The b.glen products assembled in our Anti-Aging Deep Line Care Program uses 5-Steps to improve skin from the ground up by treating wrinkle lines resulting from the natural aging process and facial expression habits – such as around the eyes and on the forehead. 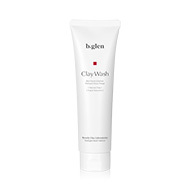 Clay based wash intrinsically cleans the skin to allow better penetration of beautifying ingredients, without removing excess sebum. 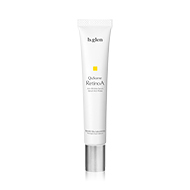 Advanced moisture retention for a maximum of 17 hours that provides plenty of essential moisture, which greatly increases the benefits of the next product. Supports the rebirth of skin through the effect of soft peeling, which guides the skin towards a more elastic feeling from the inside out. 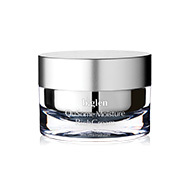 Works meticulously on the lines in the skin from the inside out. Rich cream that seals and protects moisture in the skin that penetrates deep into the horny cell layer, resulting in tighter and firmer skin.